German audience surprises Bono at the end of Northstar. U2 returns to the city where their singer’s back was Vorsprunged durch Technik. The doctors and nurses get plenty thanks, especially ‘beautiful, beguiling’ nurse Imke. During “Until the End of the World”, presumably responding to the chiming noise The Edge’s guitar was making, Bono quotes from Leonard Cohen’s beautiful “Anthem”: “Ring the bells that still can ring, forget your perfect offering, there is a crack in everything, that’s how the light gets in.” Then it’s from high brow to low brow as Bono sings “Moment of Surrender” wearing an FC Bayern Munich shirt. U2tour.de has pried some information from the German branch of Universal, concerning release dates for various remastered albums. Keep in mind that these are release dates for Germany, where CDs in general are released on Friday. U2tour.de speculate this could mean 9th/23rd june for the UK, and 10th/24th for the US. There will also be another DVD, ‘Live at Red Rocks” which is slated some time in July. G8: Are you ready to Rostock? Bono, celebrating his 47th birthday today, is set to rock the German city of Rostock during the G8 summit on June 7. He’ll be sharing the ‘Music and Messages’ bill with Die Toten Hosen, Herbert Groenemeyer and other German artists. The gig, part of Germany’s ‘Deine Stimme Gegen Armut‘ movement has been dubbed ‘P8’. 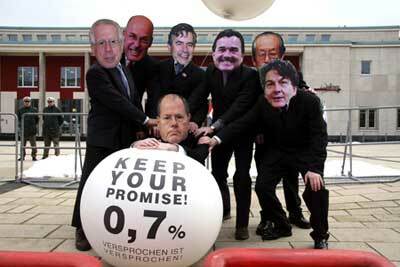 The musicians are urging the G8 leaders to keep their promises regarding commitments on aid to Africa. Tickets were sold online at the simply lovely price of 2.50 euros on May 2. Needless to say there are none left. Blogging G8: Missed Woodstock? Don’t miss Rostock! When you’re done reading all that, get your teeth in Bono’s poem/lyric penned for Gégé Katana, as published on U2.com. 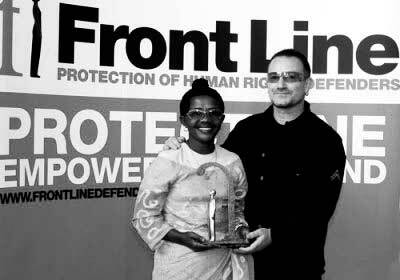 Bono read out his tribute at City Hall in Dublin on May 1st, as he presented the Front Line Award for Human Rights to Gégé. Miss Katana works on behalf of victims of sexual violence and founded the Solidarity Movement of Women Human Rights Activists in Uvira in the Democratic Republic of Congo. Who knows, we may see these words again, on U2’s next album perhaps?